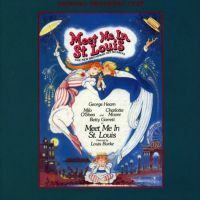 Original Broadway Cast, 1989 (DRG) (2 / 5) Back when this stage version of Meet Me in St. Louis opened, who could have ever foreseen that, not too many years later, Broadway would be reduced to a theme park full of musical revivals, revisals, and adaptations of Hollywood movies? 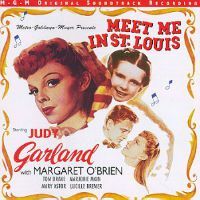 The score of the show was a mixture of the small handful of standards contained in MGM’s 1944 film and additional numbers by Hugh Martin and Ralph Blane. Ironically, the paucity of invention on Broadway over the past decade makes this technically splendid recording of a so-called “New Broadway Hit Musical” worth a second listen. A revision of a stage adaptation that Martin, Blane, and Sally Benson had concocted in 1960 as summer fare for the Municipal Opera of St. Louis, the Broadway Meet Me in St. Louis was quite overproduced; its lavish set design by Keith Anderson included a frozen pond on which dancers executed intricate skating choreography by Michael Tokar. In addition to its visual excesses, the show offered a sprightly mix of Martin-Blane songs and old chestnuts like “Skip to My Lou” and “Under the Bamboo Tree” (both in the film version as well), sumptuously orchestrated by Michael Gibson and well performed by a plucky, talented cast. It’s hard not to feel an uplift of spirit when the large pit band, under Bruce Pornahac’s baton, soars through the lush overture, with its combination of brassiness and schmaltz; or when Donna Kane, the show’s ingenue, lets rip her energetic rendition of “The Trolley Song.” The show didn’t last long in New York, but its thoroughly listenable score is a reminder that Martin and Blane deserve a page in the Great American Songbook. — C.W.